House Eller: Has it really been 20 years? My 20 year high school reunion is in the fall. I had to let that sink in. 20 years. Since high school. That means it's been 17 years since I graduated college. When I mention that my 20 year high school reunion is happening, the first question I get asked is "Are you going?" And I can understand that. There are a lot of people who are eager and enthusiastic to relive high school. And there are even more people who just don't care. Most of us move on. We get better, more interesting lives. We find out who we are. Looking back on who we were isn't always comfortable. Sometimes it's sad. Sometimes it's sad because we don't like what we see. Sometimes it's sad because of where we ended up. 20 years is the blink of an eye. A lot can change in 20 years. A lot can stay the same. So am I going? Well, yes. It surprised me a little when I found myself curious. I didn't like a lot of high school. I wasn't popular (probably a good thing). I was a band geek, a math nerd, a shy kid. So why do I want to go back? I had no desire to return for the 10 year. That was just way too close to the torture that was high school. But at 20 years? It's been a long time. And I'm curious to see how the school has changed and how the kids I knew have grown up. Because we've all grown up (I hope). I'd like to show Chris a little of the past. I went to a high school with two campuses: the old North campus for the juniors and seniors and the newer (1950s) South campus for the freshmen and sophomores. That's pretty amazing and unusual. There's a lot of history there. Some of those awful teenage years helped form the person I am today. And going back to see that is... interesting. It wasn't all bad. I had a few good friends. There are people from high school that I keep in contact with on Facebook. Am I into football? No. I had to sit through every home game in high school as part of the marching band. But the Homecoming game is part of the festivities, so we'll go. And see what the band is doing these days. And it'll be a chance to remember Mr. Pressler, Mr. Murray, and even Mr. Jirousek. I'll get to see some people I went to high school with. I'm not sure if my good friends will be there, but I'll know most of my old classmates either way. While my graduating class was big, I had classes with a large portion of the kids. Who aren't kids anymore. And many of us have kids of our own. Some of whom are graduating high school themselves. Gulp. Something I've discovered in my life is that the only things I really regret are the lost opportunities, the things I didn't do. When I've done something and it hasn't worked out, I've been disappointed. But the few things I've regretted are the ones I missed. 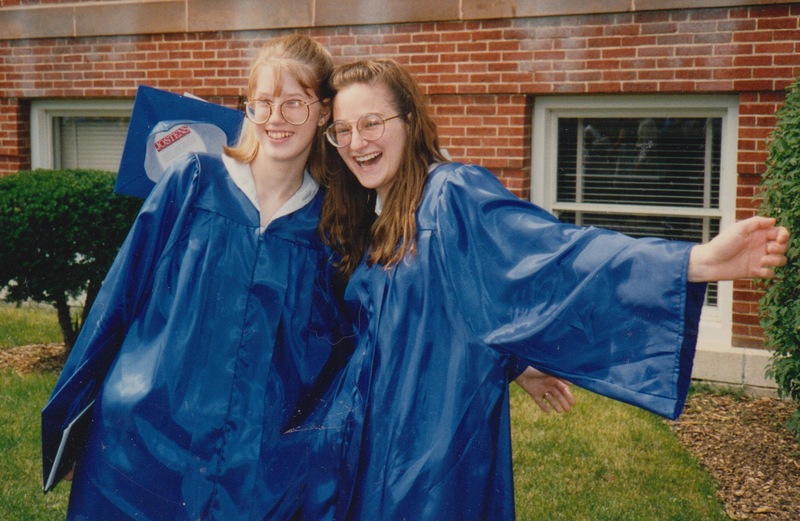 So, yes, I'll be going to my 20 year high school reunion. Because high school is a part of my past. It was four years of my life. The tough parts made me stronger. That's where I started to speak out over injustices, even when they were tiny things. It's part of who I was and who I am.